This “Mu,” which means “nothingness,” lies at the heart of Buddhism. But why a dog? In the Zen tradition, the dog was deemed a low creature. A dog was also used as a metaphor for a new student—one who would ingest anything without discrimination—just like a dog! When the monk asked Jōshū “Does a dog have buddha nature,” he was asking whether an ignoble creature like a dog (or an unsure student like himself) was capable of enlightenment. We have a different view of dogs, but the dog is still as good a symbol as any you could find for both the higher and lower side of the human self, seeking physical and metaphysical satisfaction. 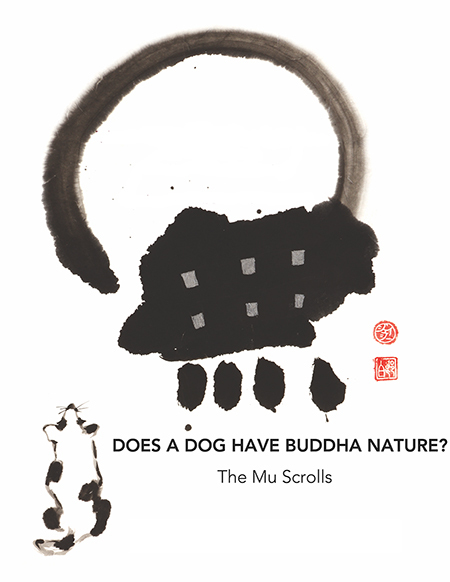 The MU Collaboration includes calligraphers and artists who have created images of MU, dogs, and a full moon—the Buddhist symbol of enlightenment. These images have been made into hanging scrolls by Liza Dalby, anthropologist, dog owner, and scroll mounter, in Berkeley, CA.